Take ten! Every time I have confronted an empty page on my computer in my struggle to write this article, it is due to a battle with the recurrent thought that there is nothing new to be said about the challenges confronting feminist movements today. Whether in Africa, Asia or Europe, if asked what are the three challenges feminists face in their contexts, they would without a doubt raise: the shrinking financial base for feminist organizing; the increasing closure of space for social justice mobilization accompanied by enhanced state surveillance; the resurgence of right wing groups and religious fundamentalisms - whether they are Muslim extremists, occupation forces, or prosperity churches flourishing across many African countries. Granted, specific issues such as violence, access to basic services such as water, food, electricity and reproductive health care, plus adequate infrastructure, access to efficient and effective justice systems and jobs would also emerge. However, the linkages between the absence of these basic freedoms to what are deemed the main challenges are clear. In addition, a long-term historical view also leads to the conclusion that what we see today are manifestations of “old” problems. The tactics may have changed in a new and evolving global environment, which means that the tools available to patriarchy have become more sophisticated even if the message has remained basic at its root - maintain male supremacy and the structures that allow that. The paper would be done. It would also be corroborated by existing reviews on Beijing Plus 20 and the ubiquitous Sustainable Development Goals conducted by frontline women’s rights organisations that tirelessly lobby their governments for shifts on women’s rights in Addis Ababa (African Union), New York (United Nations) and their various capitals. 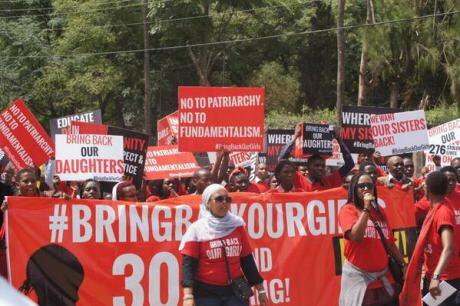 Whilst recognising the specificity of contexts and historical dynamics that shape feminist organizing, at the root of my analysis is that the challenges feminist movements, organisations and activists face in their respective countries, cannot be disconnected from global discourses. First, these global discourses are increasingly framed by securitization, which gives license for greater state intrusion into citizen’s lives. As governments coral citizens around the notion of securing them from the now ubiquitous threat of diverse reincarnations of Al Qaeda, women are mobilized as mothers to contribute to de-radicalising young men. Consequently, the spaces occupied by women are re-written through public narratives that re-assert conservative performances of hetero-normativity – hunter/gatherer, security/nurture models. As national investments towards security increase, remaining stagnant or non-existent are the resources necessary to address daily security threats that women face, specifically, violence in the public and domestic sphere. The absence of adequate infrastructure, human resources and a commitment to seeing change for women’s security remains. This occurs even though intellectual conversations have since expanded to recognize human security as a useful framework in as far as it recognizes that the threats that citizens face today are not only always externally generated, but are also informed by governments actions. In the context of securitized discourses, challenging extremism has become a metaphor in some contexts for opposition and dissenting voices. In 2013, after the massacre of people at Westgate in Nairobi by individuals allied to Al Shabaab, I travelled to Burundi on a work assignment. On arrival in Bujumbura, I observed the heightened security measures at the airport and remarked to my host that I was curious about the factors that had led to this. My host remarked that a week before our arrival a group of about 100 people had been rounded up as suspected Al Shabaab members. In the larger scheme of states that are considered to be at threat of Al Shabaab attacks, Burundi ranks low, despite its large troop-contributing role in the African Union Mission to Somali. It turns out the 100 suspected terrorists were individuals that were challenging the incumbent’s regime. It is no surprise therefore that Burundi imploded in 2015, despite existing internal warning around the nature of statecraft. Countering extremism has stalled, sometimes unsuccessfully, conversations about the national project as is evident in Burkina Faso, Burundi, Kenya and Egypt. The threat of “external forces” is used to mask internal problems that provide the basis for often broadening national disgruntlement. In all these instances women, their bodies, their autonomy is positioned as central to either re-claiming the national project through controls over their reproductive and productive capacities or through violence to discipline any attempts at subversion and reclamation of hard won freedoms. Second, the forces of global capital have led to increasing, if not an overwhelming interest by “big business” in women as under-served and therefore a “constituency” that must be captured. Inequality and its resolution are constructed as the need for investments making cents. “Womenomics” is based on women’s value to communities, which basically translates to women share wealth. Coca Cola Foundation among others shore up data to support this assertion through statements such as these: “women invest 90% of their wealth into family and communities” or if “US businesses were their own country they would be the 5th largest GDP in the world”. “Women as the next economic frontier” is informed by the need to decrease economic dependency by the global South on larger economic blocs. “Developing countries” need to be self-sustaining, which requires all hands on deck. Business interest in women is not intended to deal directly with the power structures that isolate women in their diversity. The costs of women giving back, or cushioning societies where states and social protection systems fail or are absent, are not a focus of this model. In fact, it proceeds from the assumption that “women giving back” is natural and is how we are wired, and it is on that basis that investments are made. It takes the path of least resistance: money, economic empowerment and business catalyse financial growth within the powerful systems that foster inequality. It is also worth noting that while there is more money targeted at women generally, the money available to women’s movements comprehensively addressing gender inequalities is shrinking. There is a discernible pattern in the ways in which US money is being managed. Money is channelled to businesses, subsidiary organisations and mentors associated with the pledging organization. Third, contemporary feminist organizing has to confront erasure. The kind of erasure that allows Barrack Obama’s “you cannot play with half your team on the bench”, which is phrase from a speech made in Kenya in 2015 to become the go to quote to explain inequality. The erasure that makes Lean In the most important reference book for understanding the meaning of success despite its glaring assumptions about how race, class, age, geography determine the basic guidelines of how we should lean in. The erasure that makes TED talks read as more accessible, so simple, so clear, whilst muting feminist histories, knowledge building in academic spaces, in participatory research groups, through our organizing, documentation projects and oral herstory initiatives that have foregrounded the nature of patriarchy. That the intransigence of patriarchy is reliant on the simplicity of its message is well known to feminists. However, the erasure project packaged as “simplify your message”, “build better alliances”, wants us to believe that dismantling patriarchy is not about disentangling visible and invisible networks that operate within institutions, language, codes, discourses, hidden and covert messages. Yet we know, this is what it is about. This work is hard, it is draining, it is soul breaking and it is never simple. This work requires theory building and grounding movement work in theory, which in the feminist universe has never been disconnected from our lives and our work. It is work that cannot be reduced to lean in, engage men, cost violence and big data. Having recognized the ways in which these three factors influence our movements, I conclude that it is in contexts in which there is regression, closure and even fatigue that the most powerful forms of resistance arise. I would like to highlight some of the insights I took away from watching university students in South Africa fight for the right of the black majority to have quality education. I believe there are important theoretical, mobilization lessons despite the complexities that are bound to be present given context and history. On 9th March 2015 what is now known as the #RhodesMustFall protest movement begun at my former alma mater, the University of Cape Town (UCT). 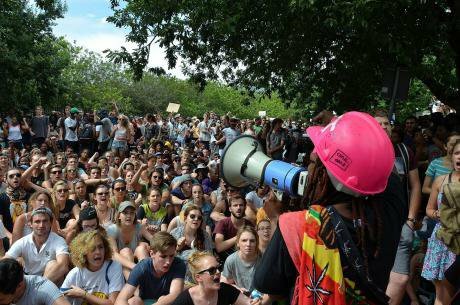 Led by the black student community, the one-month protest presented a set of demands to the university administration that were symbolically represented in the demand for the removal of the statue of Cecil John Rhodes. Cecil Rhodes was a British imperialist whose views around capital, labour and land, led to the disenfranchisement of the Black population in South Africa, Zambia and Zimbabwe as he led the accumulation of vast diamond resources at the expense of the local populace. Substantively, the student’s demands were framed by a historical and structural analysis of the nature of higher education specifically and education generally in South Africa. In this regard, racialised and exclusionary university systems are reflective of and expand exclusionary practices that affect the black majority in South Africa. These energies percolated across South Africa in 2015, crystallizing in the collective call (#Open Stellenbosch, #DecoloniseRhodes) for free, decolonised and therefore equitable access to education through the #Fees Must Fall movement. Inevitably, the business models of running institutions of higher learning and by extension the service conditions of workers became key areas of interrogation. The Fees Must Fall movement re-centred a decade old debate about the state of higher education specifically and education generally in Africa. If education and a sufficiently skilled and educated populace are deemed as drivers of socio-economic and political growth in Africa, then resolving the massive exodus of young people to institutions of higher learning in the Global North and subsequent skilled labour must be resolved. At the heart of these conversations is a return to the circumstances that informed the decay of higher education in Africa – the Structural Adjustment Programmes proposed by the World Bank in the 1990’s. Much like the popular uprisings in Egypt and Tunisia, the energies emerging from #FeesMustFall reflect the crisis of public resource distribution to basic public goods, whether it is education, health or the social contract (governing) and concomitant accountability to the citizens. The diversity of engagement strategies adopted by citizens to hold states accountable even in difficult and dangerous circumstances is a clear illustration of organizing despite the state on the one hand and the role of technology in connecting issues and actors across the globe on the other hand. It also points to the evolution of organizing from one that focused on formal, registered entities to sporadic, issue based, multi-generational mobilization. However, there are three things important things to note from these movements. 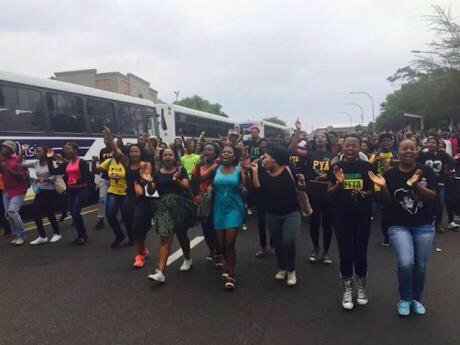 First, is the power and resurgence of youth mobilization; second, the intersectional and structural nature of the analysis that #FeesMustFall (FMF) organisers in particular brought to their work and finally the intransigence of patriarchy. First, the idea that young people in Africa are apolitical and disinterested in shifting the ways in which real politik is conducted has been dismantled. FMF in particular illustrated young women playing frontline roles in leading, mobilizing and occupying space. It brought to the fore the importance of freedom as currency. For young women specifically and women generally, the notion of freedom is critical to defining their interaction with formal power, since the lack of it limits the possibilities for access. Young women tend to move out of the youth bracket faster than their male counterparts of the same age and same marital status who continue to negotiate youth-hood despite marriage. The burden of household responsibilities, marriage and children often allocated to young women restricts women’s mobility. The lack of mobility limits young women’s networks and resultant social capital. These are the vectors of freedom I am referring to, diverse forms of freedoms that allow women to access spaces that are consistently re-constructed to exclude them. 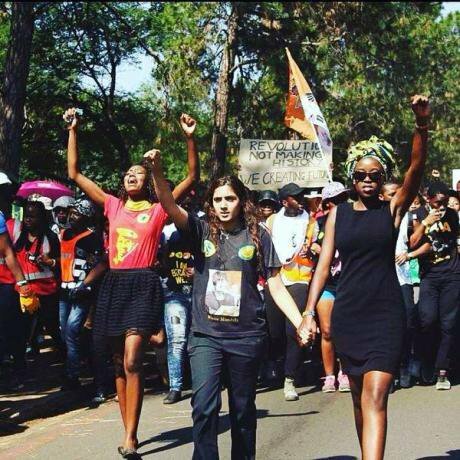 Second, the women involved in FMF were consistent in their insistence in protecting freedom FMF was the consistent in calling out sexism, homophobia and hetero-patriarchy when it reared its face including the efforts to erase women’s leadership. Being present to the moment of exclusion and making it visible was also a factor of the ways in which technology was deployed and the ability for alliances to be built across the continent on the matter. Finally, whilst recognising the difficulties that are bound to exist within political organising, watching FMF from afar drove home the meaning of being an ally to a movement. As a movement started by students and later working in solidarity with contract workers, the students were clear that they were the voices and everyone else needed to be in solidarity with and not become voices for their organising. By understanding young women as political actors, discourses on the nature of society in its broadest and most specific terms are opened up. Critically these uprisings have pointed to the fact that acute under-representation or inactive participation of youth (in their gender and class diversity) in formal decision-making institutions and processes (other than voting) form the basis of systemic contradictions that spur youth movements. It is in the context of resisting the erasure of labour, bodies and thought that violence emerges as a tool to discipline women. For FMF, these were moves emerging within the movement and not necessarily by state agents as occurred with the virginity tests on women at Tahrir Square. Violence from within or without has the net effect of curtailing women’s public participation and subverting women’s agency through persistent sexual harassment. Nadia Taher writing on Egypt observes the impact of these tactics through a shift in the language deployed by women during later protests at the height of Mohamed Morsi’s tenure. “Women as mothers, daughters and sisters” became safer, culturally acceptable identities that would legitimize women occupying public political space and making demands for change alongside others. It therefore follows, and this is my final point, that when so called progressive spaces stifle opportunities to truly dismantle patriarchy but instead sustain and propagate structural oppression; the importance of autonomous feminist spaces cannot be over stated. They are an important lifeline for feminists to re-charge and breath in a world that remains hostile to women’s freedom. Autonomous feminist spaces must be guarded jealously. We must stay woke. Awino Okech will be speaking at the forthcoming AWID Forum Feminist Futures: Building Collective Power for Rights and Justice, 8-11 September, Bahia, Brazil. openDemocracy 50.50 will be reporting daily from the Forum.